Shoojit Sircar redeemed himself after the failure of his first film with the commercially and critically acclaimed hit Vicky Donor. Vicky Donor was a light, frothy film about the life of a sperm donor. Madras Café by the looks of the trailer seemed as diametrically opposite from Vicky Donor as possible. The trailers portrayed an edgy, dark espionage thriller and the promotions were kept low considering the genre of the film. Indeed Madras Café will work only with a good word-of-mouth. Let’s discuss how Madras Café eventually shaped up. 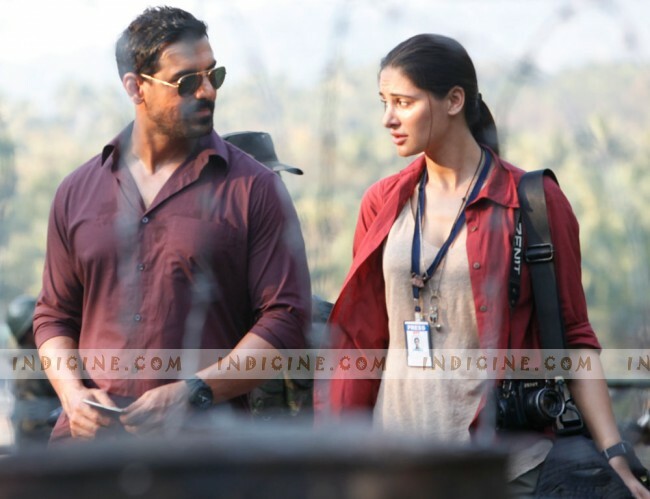 Story: An Indian intelligence officer Vikram Singh (John Abraham) is sent to Sri Lanka to work for a covert operation. His job is to bring a peaceful resolution to the ugly clashes which wrecked havoc in the country due to the violent civil war. Whilst there, he discovers different motives, different plans (among which is a plan to assassinate the former Indian president). He chances upon an Indo-British war correspondent Jaya Sahni (Nargis Fakhri) who turns out to be of great help for him. The story then progresses like a subdued thriller and ends in one of the most humanely empathetic finales for a Hindi film I have seen in a long time. Watch it to believe it. Screenplay and Direction: The writers Somnath Dey and Shubendu Bhattacharya don’t miss a beat. They have imbibed the pseudo-realities of those times into the narrative and added their own layers of fiction into the screenplay without ever losing touch with the reality. The dialogues are also appropriate for a film like Madras Café and works in tandem with the steady direction of Shoojit Sircar. The films hold up from start to finish due to the assured directing skills of Shoojit. I can safely say that on the hands of any other less competent director, Madras Café wouldn’t have been half as good a film as it turned out to be. The unbiased narrative should be applauded by one and all. Miscellaneous and Music: Madras Café looks exquisite and real because of the camerawork by Kamaljeet Negi and the production design by the production designer. Kamaljeet’s cinematography makes us feel like we are a part of the world of the film and yet we are allowed the distinction of forming our opinions unlike the characters in the film who have to do everything instinctively. The editing is first rate and keeping an expansive film like Madras Café down to a meagre 130 minutes must have been a difficult task for the editor. The action scenes too are shot with elan without being overtly stylistic. The music and background score by Shantanu Moitra gives Madras Café the mood it aspires to have. It lifts the film up. Acting: Can’t say it any other way – John Abraham delivers his life’s best performance. Maybe not his career defining performance but certainly his best work. His Vikram Singh looks like a real law enforcement agent and the performance works primarily because Shoojit has astutely not made him the center point of Madras Café. Nargis Fakhri delivers a surprisingly good performance and is believable as the war correspondent. The other actors in the film like Siddharth Basu, Prakash Belawadi, Ajay Ratnam all deliver top notch performances. The casting of Madras Café is one of its biggest strengths because everybody looks real in their roles. Conclusion and Box Office: Madras Café is perhaps the best spy thriller ever made in Hindi cinema. It keeps its aspirations low and doesn’t overreach. The story moves along fluently and the viewer is not left out, even if they don’t have any knowledge of the time and incidents Madras Café refers to. Madras Café deserves to be seen by the ones who like dark, edgy, realistic films. Box office wise, as expected due to the low buzz, Madras Café won’t open well. But I can safely say that the film will pick up and might even turn out to be profitable for the makers. Chennai Express beats 3 Idiots, SRK takes the top spot again! Hope this movies does well and Chennai express continue it’s record breaking numbers. hats off to john abraham for starring and producing such a issue based good film.indian public should see these types of films not craps like ce,outimd,ett,d2. if ce downgrade cinema than madras cafe is a treat to watch.its shows the developed power of good film making in bollywood.superb thriller. Nargis! you just retire now! You’re a flop actress. Go the the place where you came. Watched it yesterday……..so real….nothing was fake…..no songs….no high flying action…….it was the experiance of watching like a hollywood movie……. Best movie of d yr so far !